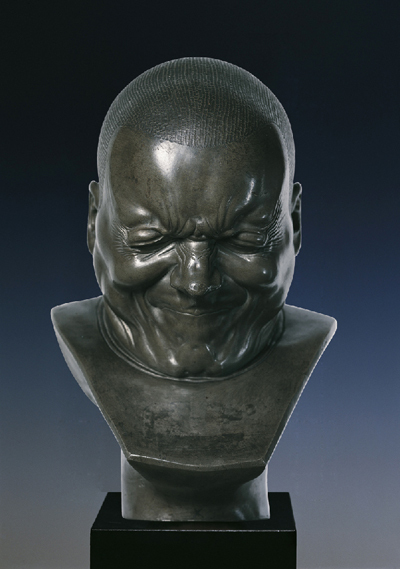 The Belvedere in Vienna has sixteen of Franz Xaver Messerschmidt’s so-called “character heads” in their collection. 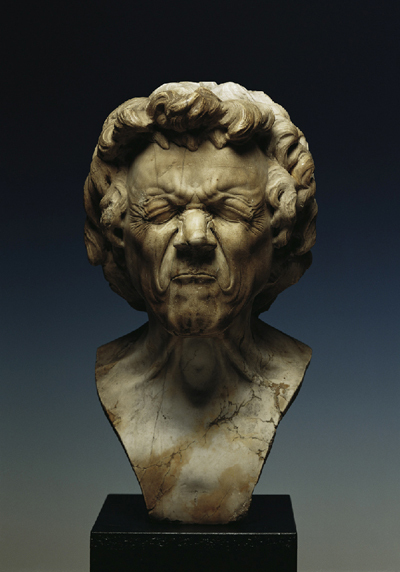 Messerschmidt, born in Bavaria in 1736, studied sculpture and completed early court commissions in Vienna until his sudden departure in 1770, after what is variously referred to as a psychological breakdown, a personal crisis, or simply, professional failure. 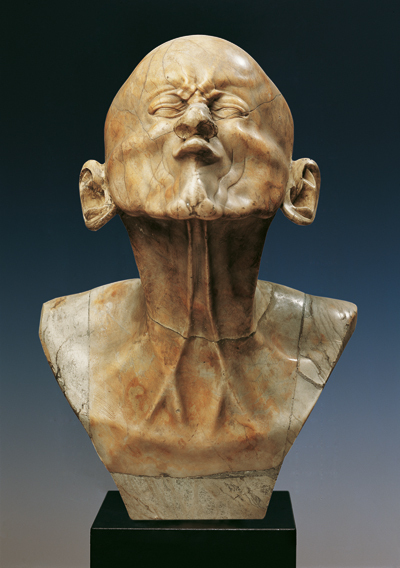 Created between 1770 and his death in 1783, Messerschmidt intended for his heads to collectively show the full range of human emotion. 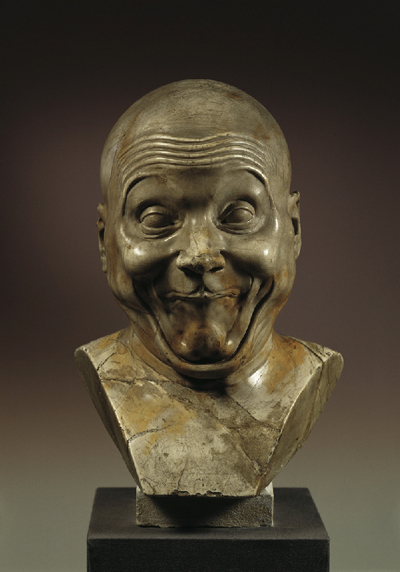 An early bust of Messerschmidt’s friend, Franz Anton Mesmer, has led to speculation that the character studies were inspired by Mesmer’s experiments in hypnosis, “animal magnetism,” or “mesmerism.” The Belvedere’s website says 54 of 69 heads have survived; the Getty’s also puts the number of finished heads at 69 but claims that Messerschmidt “reckoned” the full complement of human expressions to be 64. The thumbnails below, found on the Belvedere website, don’t quite convey the experience of seeing the heads in person. The backgrounds are too moody. In situ, the heads are arranged, each on its own pedestal, in a circle within a polygonal tower at the building’s end. They are surrounded by windows, marble, and the expected surfeit of baroque ornamentation. 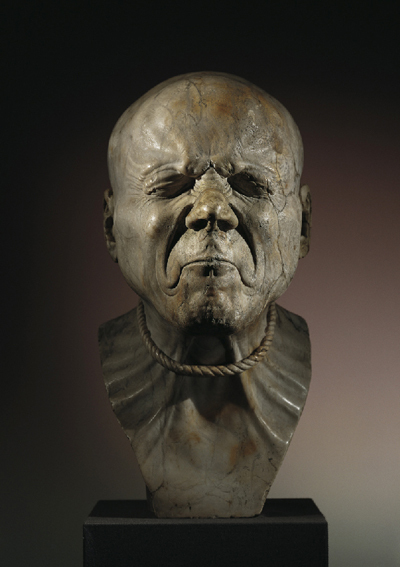 In this setting, the heads are lively rather than somber, more often humorous than frightening. They are, more than anything, unexpected and odd. On a street in Cobble Hill, Brooklyn, 37 small pumpkins carved like jack-o-lanterns remain long past their autumn-prime, impaled on the posts of a wrought-iron fence surrounding a handsome brownstone. (The parodied image of a gothic fortress comes to mind.) Presumably, these pumpkins have kept their vigil since mid-October; having survived Hurricane Sandy, perhaps their owners didn’t have the heart to later depose them. Through the winter, the heads have weathered: toothless grins now sag and gape; eyes squint and yawn; foreheads have caved-in; the pumpkin skins are discolored; some heads have nearly melted while others have turned to leather. Now February, the heads have accumulated small personal histories which they wear in their grotesque, and surprisingly comic, expressions. 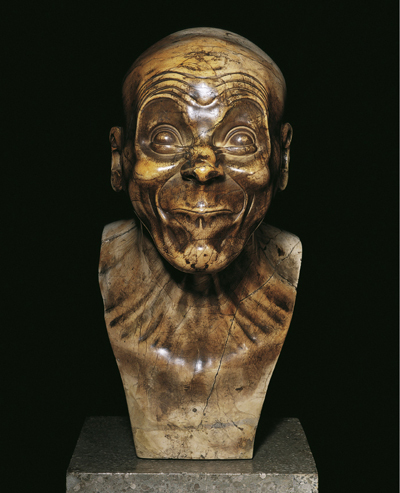 To have thought, immediately, of Messerschmidt’s “character heads” is probably a careless (but undeniable) impulse, a facile comparison that is satisfying in the extreme.